Kirby’s Adventure was the last great NES game, and Hal’s pink, spherical hero once again closed out a Nintendo console with the SNES. The Nintendo 64 had launched in 1996, with Kirby Super Star and a handful of other classic titles insuring the 16-bit system went out in style (it wouldn’t be inaccurate to claim the SNES had a better ’96 than the N64 did). But Kirby was to perform double duty for Nintendo’s 16-bit console, and saw a second adventure hit the SNES in 1997. Kirby’s Dream Land 3 was the last Nintendo-published game released on the SNES, and due to the N64 being well established by this point – as well as ignoring many of Super Star’s changes to the series in favor of a direct continuation of Dream Land 2’s formula – Kirby’s Dream Land 3 was far from a best-seller in its time, and even had a mixed reception upon release. This is a crying shame, because in many ways, Kirby’s Dream Land 3 feels like the series’ definitive entry, and ended the Super Nintendo’s run on a major high note. As stated, Kirby’s Dream Land 3 left behind most of the abilities introduced in Kirby Super Star, instead adopting the seven ‘traditional’ Kirby powers (burning, ice, spike, cutter, parasol, rock and spark), as well as one additional new ability, cleaning, which takes the form of a broom. Like Dream Land 2 and Adventure, each ability consisted of a single move. By simple description, it’s easy to see why many would think this is a step back from what Super star accomplished just one year prior. But Dream Land 3 has a few tricks up its sleeve to not only give these copy abilities a sense of variety, but also in giving them a greater sense of purpose in the overall adventure. 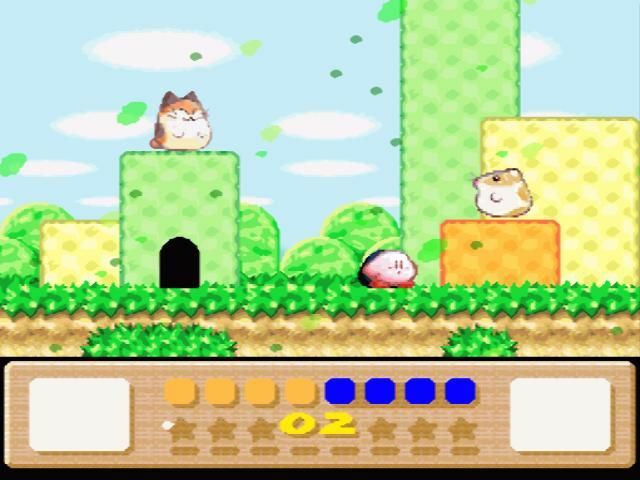 The first – and most obvious – gameplay addition is that Dream Land 2’s animal friends (Rick the Hamster, Coo the Owl, and Kine the Sunfish) are joined by three additional friends: Chuchu the Octopus (who looks more like a female Kirby), Pitch the Bird, and Nago the Cat. 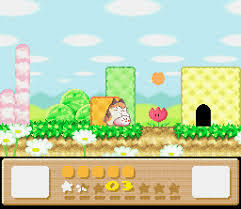 Like in Dream Land 2, combining the different copy abilities with each animal friend produces a new power, which greatly expands the uses of both the powers and the animal friends. Additionally, along with Coo being able to fly with ease and Kine being a fast swimmer, Rick now gains the ability to wall jump, and each of the new animal friends come with their own abilities for travel. Nago is able to triple jump, and Chuchu can float for a short time, as well as cling on to ceilings. Pitch is able to fly as well, albeit his short stature makes it harder for him to carry Kirby’s weight, making him less graceful than Coo. Pitch can, however, run faster than any of the other friends on the ground, making him handy both on land and in the air. Another deviation from Super Star is that Kirby can no longer turn his powers into allies for a second player. Co-op still returns, however, with the introduction of the character Gooey, a peculiar blob with the same copy ability as Kirby, though he prefers to use his prehensile tongue over inhaling foes. Gooey can even be summoned when playing solo, but it isn’t recommended, as he may take out enemies before you get the chance to take their powers. Perhaps Dream Land 3’s biggest contribution to the series is that – while it is an easy adventure that makes for a nice, relaxing experience for one or two players – there is an added sense of difficulty brought into the mix for completionists. Once again, the evil entity of Dark Matter is invading Planet Pop Star, possessing King Dedede and his minions and covering the world in negative energy. In order to combat this negative force, Kirby must do good deeds for the citizens of Dream Land, which rewards him with Heart Stars, which hold the positivity needed to drive Dark Matter out of Dream Land. For more easy-going players, you can simply blast through the levels and make your way to a confrontation with King Dedede, which will still provide plenty of fun with the game’s clever level design and overwhelming charm. But if you want to beat the game to full completion, you’ll have to figure out how to claim every last Heart Star. And unlike Dream Land 2, which merely included one hidden item per world, every single stage of Kirby’s Dream Land 3 hides a Heart Star. In order to gain these Heart Stars, Kirby and Gooey will have to make full use of the copy abilities, animal friends, and combinations thereof. Every Heart Star will require Kirby to perform a good deed for that level’s NPC. Some of these objectives are simple, like avoiding stepping on flowers or making sure you have a specific animal buddy by the end of the stage so they can meet up with one of their loved ones. But others will require deeper exploration into a stage, and will need Kirby to find the right ability combination to solve a puzzle, uncover hidden objects, or even overcome a mini-game. Kirby’s Dream Land 3 may never be full-on difficult, but it epitomizes the series’ combination of being an all-ages adventure while also providing an extra challenge for those looking for it. Much like Kirby’s Adventure on the NES, Dream Land 3 being released at the tail-end of the SNES’s lifecycle meant that it brought out the best in the console’s technical abilities. Kirby’s Dream Land 3 is simply a beautiful game. Seemingly taking inspiration from Yoshi’s Island’s storybook aesthetics, Dream Land 3 takes things further with an art style molded from crayons and colored pencils. Kirby’s Dream Land 3 looks like a child’s drawing come to life in video game form, and somehow seems largely forgotten in discussions of great video game art styles, a discussion it very much belongs in. There are additional visual effects added to many stages, pushing the SNES to its graphical limits. 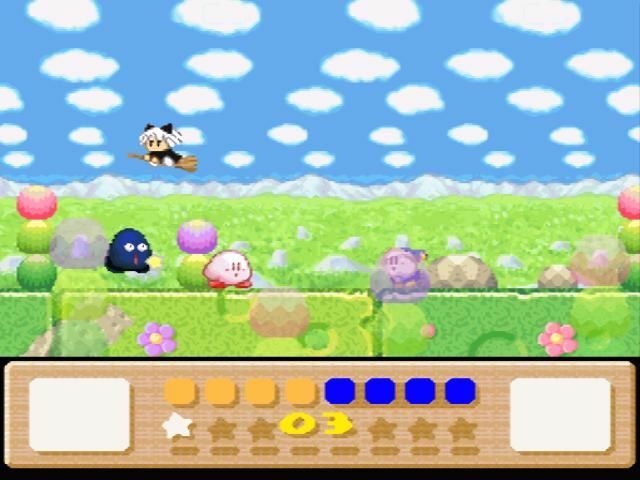 These effects, combined with the art style, make Kirby’s Dream Land 3 one of the best looking SNES games. The only downside to the visuals is the knowledge that we’ll probably not see another game that looks like this. As usual for the series, the timeless visuals are joined by a stellar soundtrack. Kirby’s Dream Land 3 features a score that, fittingly, sounds every bit as beautiful and dreamlike as the visuals look. Sadly, much like the game itself, the soundtrack never seems to get the attention it deserves, as it stands as one of the best in the series, and one of the more underrated soundtracks on a console that was no stranger to great soundtracks. While at first glance it may seem like Dream Land 3 is merely lacking in what Super Star brought to the table, it ultimately feels like the deeper game due to what it does with the most traditional Kirby formula. It takes the foundation of Dream Land 2, and expands on it in every conceivable way. The new and returning animal friends, creative level design, and added sense of exploration make it a great game in its own right. Combine that with an all-time great art direction and a fantastic soundtrack, and you have what may not only be the best ‘traditional’ Kirby adventure, but also one of Nintendo’s most underrated and charming games.